San Diego County plans to vote on a new migrant shelter. 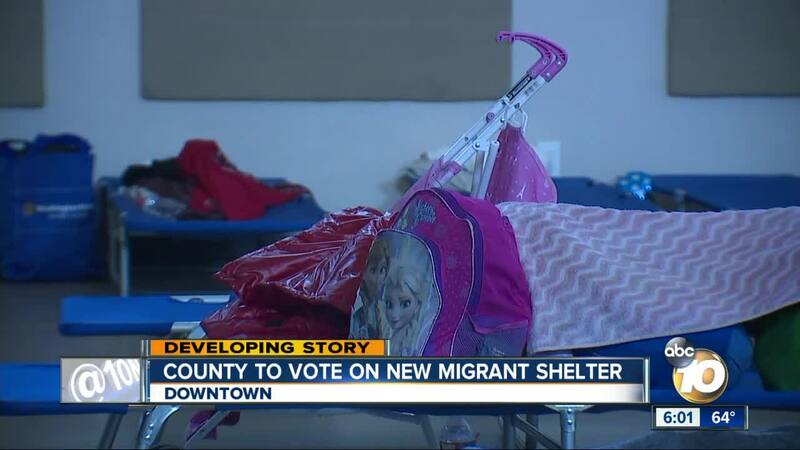 SAN DIEGO (KGTV) -- County supervisors Tuesday passed a motion to temporarily house migrants in the former family court building downtown. The motion passed 4-1 Tuesday morning. The building, located on 6th and Ash will house migrants until December. The San Diego Rapid Response Network, a coalition of human rights, service and faith based organizations will run the shelter through December. "We've moved the shelter five times already and we really don't have a plan B, so this county property is really ideal for us," said Michael Hopkins, CEO of Jewish Family Service. The network has helped more than 5,000 migrants since early November. The 6th Avenue location was chosen after studying more than 20 sites. "No location is perfect. This location, for example, doesn't have a kitchen or a shower, so we are going to need to bring in food and portable showers. None of the locations were ideal. This location is a bit better because of its proximity to the bus station, proximity to the airport, the size of the facility, our ability to secure it properly to create a safe environment," said Hopkins. The Rapid Response Network has to vacate its current shelter by February 15th. Hopkins said without a new place to go the families will be released out onto the street. "This country is right now divided around immigration and the wall and all sorts of those issues, but these are mostly moms and dads and children that have been processed through the government and have been released. We're just making sure they get on their way to their final destination," said Hopkins, adding that most are connected with relatives in other parts of the U.S.
"I hope that they see this as not a political issue, that they see this as a humanitarian issue, they see this as a public health issue," said Hopkins. David Khwaja owns the 7/11 just steps away. He supports opening a shelter for migrants, but not next door to his business. "We are suffering. We are losing a lot of money monthly. A lot of businesses in downtown San Diego went out of business because of this homeless situation," said Khwaja. Humanitarian groups say the homeless problem will only get worse if the migrants are released with no place to go. . "San Diego has already experienced a Hep A crisis and this potentially could be a public health issue if we don't deal with them properly," said Hopkins.